Assessment is important for the purposes of determining mastery of content or skills. Rivendell uses a “body of evidence” to determine growth, achievement, and mastery. A single score on a standardized test cannot give us the whole picture of a child’s performance. Each Fall and Spring, classroom teachers schedule conferences with each student’s parents. Conference notes, written by your child’s teacher, are a wealth of information about your child, and in the fall, will include individualized academic SMART goals (Specific, Measurable, Achievable, Realistic, Timely). Goals are re-visited in the spring for parent/teacher conferences, and progress is communicated throughout the year. Rivendell teachers also include goals that focus on the social and emotional aspects of learning. The purpose of the mid-year progress report is to communicate students’ social-emotional learning and academic progress based on Rivendell’s benchmarks and goals set earlier in the year. It highlights current performance levels, student strengths, and areas for continued growth. Benchmarks are a set of indicators that let us know if a child is on track, not quite where they need to be, or further along than expected. Benchmarks are used to inform educators and parents about student needs and abilities, and we know that not all students reach the same benchmarks at the same time. Your child’s progress in relation to identified benchmarks will be communicated at Fall and Spring parent-teacher conferences. With small class sizes, Rivendell teachers get to know each and every student, what their strengths are, where they might struggle, and what their likes and interests are. Rivendell teachers meet and conference with each student daily about their reading, writing, math, and other work. Instead of paper/pencil tests, students often must show the teacher that they have mastered a skill or concept with a task that will show their level of mastery. Teachers work one-on-one with each student and take the time to observe if students have mastered a concept before they move on to the next one. Math tests are given at the end of each math book to determine mastery and whether or not a student should move along in the Rivendell math progression. Rivendell does use standardized assessment tests. 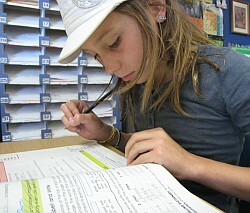 Students in grades 2-6 take the MAP test in the fall and spring each year. While MAP does provide nationally-normed percentile and grade-level-equivalence data, it also gives Rivendell teachers a wealth of individual data. The computerized MAP system dynamically adjusts to each student's learning level, helping create customized learning goals for each student. The MAP tests themselves are not the focus of any Rivendell instruction, and the tests take only about three hours each semester. Rivendell also uses overall MAP results to determine if our curriculum and instruction in academic content areas is providing the appropriate levels of challenge for our students. Feedback is an important component of the learning process. Rivendell School does not assign grades to student work. Instead, we prefer to give students feedback about their work so that they experience what it truly means to learn and grow. A grade might or might not mean anything to the student, or a student might simply accept a low grade and move on. However, at Rivendell, we believe honest feedback about student work, combined with a nurturing and supportive relationship between student and teacher, creates an experience that is much more focused on true learning. The student who gets feedback on their work and is expected to improve will learn so much more from the feedback experience than if they had simply been assigned a grade.